Who knew that a ruler would be the most commented on thing in last weeks video tutorial? I didn't give it much thought really. Several people had asked the week before for me to show the trimming step because they were new quilters and wasn't really sure what to do. Not a problem! Well after last week's video I was overwhelmed with the reaction not to the block but to the ruler. So for my sanity and maybe to answer the question for those who are too shy to reach out I'm writing this post. The method I used last week for the pinwheel block is probably one of the more popular methods to make half square triangles. It also requires a little trimming up when you are done. 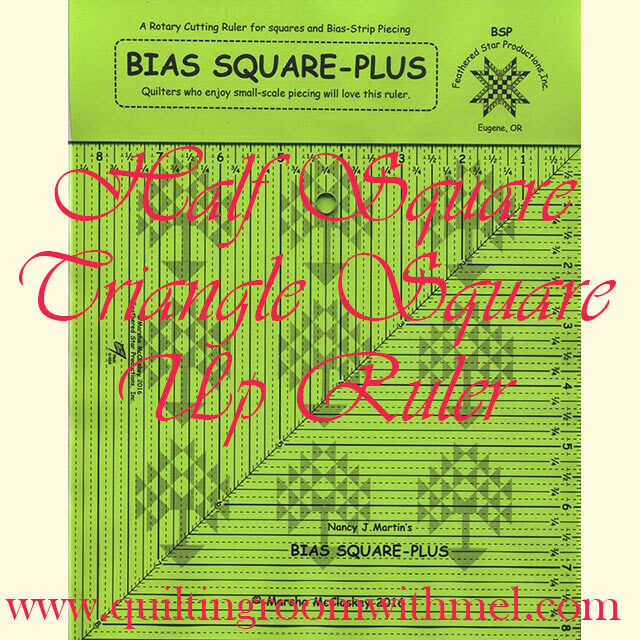 There are a ton of tools available on the market today and depending on which quilter is teaching the method the tool can change. I know Jenny Doan with Missouri Star Quilt Company uses the bloc loc ruler for trimming up and Eleanor Burns with Quilt in a Day has her own ruler. The ruler I use had to have been my mom's because I don't remember buying it and after a little research the version I have went out of print in 2001. 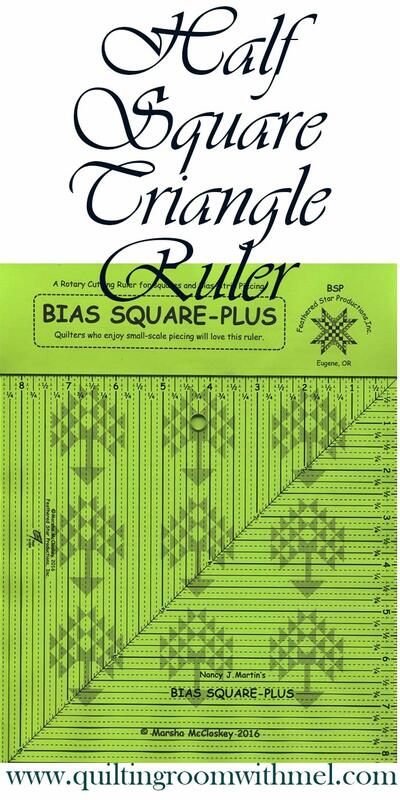 I was a little bummed to find out that my beloved ruler is no longer in print. I started looking for a new ruler to use because I want to be using products in my tutorials that you all can actually buy yourselves. I was thrilled to find a very similar ruler on Amazon. Ok, I wasn't thrilled as much as I was relieved. I am a creature of habit and didn't want to switch to another ruler. I would have switched for you guys though I just didn't want to unless I had to. This ruler has the original maker's name on it but is copyrighted by someone else. I'm guessing she bought the rights to the original ruler. I'm so thankful for that! The new version of the ruler is bigger than mine. Mine is a 6" ruler while the new one goes up to 8 1/2". The diagonal line is why this is my go to the ruler for half square triangles. That line allows me to see that when I trim up my block I'm not going to trim off my points. Those points are what makes a half square triangle block, without the points they just don't look the same. If I'm sewing in a hurry I have a hard enough time getting my points to come out right so I need all the advantages I can get. I know $24 looks like a lot of money for a specialty ruler but think of all the blocks you use half square triangles in. They are everywhere! Do yourself a favor and buy yourself the ruler. You'll save yourself time and money with it. I know when I don't use it to trim up a half square triangle block I always end up with at least a few blocks that I whacked the points off and then I have to remake them. I've used this ruler for the same thing but got mine for bargain price of 99 cents at Salvation Army store. I couldn't figure out how to use til I stumbled on squaring HST with it.